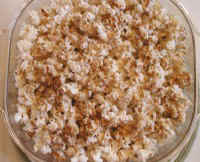 We use a microwaveable dry popcorn maker to this recipe, but any other dry or air popper can be used. Place the designated amount of popcorn in the popcorn popper and follow the manufacturer's instruction for popping the corn. 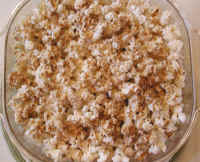 When the popcorn is finished popping, but still hot, spray on a thin coating of soy sauce, mix gently and spray on additional soy sauce. This is the only way we have found to keep the popcorn from getting mushy.